It’s just that I’ve invested way too much time and effort into growing food only to let my chickens eat it all before me. Wait, that’s a different issue for another day. What I meant to say is only to run the risk of wasting it for what seems an awful lot like controlled spoilage. 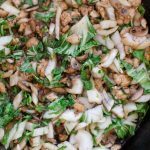 I think it would be different if I was accustomed to making it and we were used to eating food that way, but we’re not and the learning curve has always been intimidating. I tried fermented pickles, traditional sauerkraut, you know the usual suspects, but neither went over well they end up making me really appreciative of my Partners in Homestead Waste Management. Food that we can convert into bacon is never a waste! But I do recognize the health benefits and have wished for a way to overcome my anxiety… and get a second spoonful into my families mouths. So I’ve settled for what sourdough, raw milk, yogurt, and cheeses can do for our health in similar ways. But I continue to be interested in the subject and have been hopeful that, one day, I’ll acquire a new food preservation skill. That day my friends has arrived. 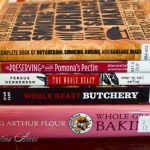 I was virtually thumbing through a book a few weeks ago, O’Lardy’s Guide to Fermenting Fruits and Vegetables to be specific, and by the time I was a few pages in, I was wondering if I’d been making a mountain out of a molehill this whole time. Wondering if it was really as simple as it seemed. And how it was that they were actually making it seem like something we might actually want to eat. I kinda felt like that was their intention… and I was feeling a bit inspired and a smidgen of skepticism. But a couple recipes caught my attention… one for Peach Chutney and another for preserving jalapeño rings. I had just harvested a bunch of jalapeños and was wondering what to do with them so I popped a cup of milk on the stove, heated it up, spilled in a glug of vinegar, spooned the curds out of the whey, sliced the peppers, added some salt and the whey, and 5 minutes later I was done preserving lacto-fermented jalapeño peppers. Super quick, little mess, no canner steaming up the already hot kitchen. No sampling the finished product yet and we were already on our way to a win. Then I started in on the Peach Chutney. It wasn’t but a few minutes before it too was sitting on the counter, all lovely in it’s colorful contrast with the vibrant peppers. And here we are a couple weeks later and I finally screwed up the guts today to unscrew the lid and dip in a spoon. The zing was unexpected, but the peachy flavor was preserved really well… It was, in fact, delicious. Ben was nearby and sampled it with me. “Hmm..,” he said, cocking his head, “Let me have another bite.” And that, my friends, is really all you need to know. You could have knocked me over with a feather. Heretofore all fermented foods I had made were spit out. Second tastes were unfathomable. The peppers turned out just as well… the fermenting actually seems to have intensified the heat somewhat and I’m excited that we’ll have about 6 months of hot peppers on hand. So excited in fact that I started another batch this morning. If you’ve been wanting to learn how to ferment your own fruits & vegetables and the thought has been overwhelming you and you don’t know where to start or what recipes to try, I think you’ll really want to look into O’Lardy’s Guide to Fermenting Fruits and Vegetables! 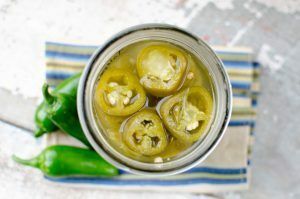 Slice your jalapeños into rings and pack into a wide-mouth quart sized jar. Place in the fridge for cold storage, for about 6 months. What should I try next? 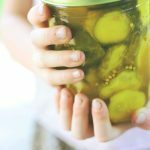 Tell me your favorite fermented food? 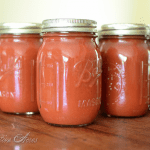 Why I’m NEVER Canning Traditional Tomato Sauce Again! I love the line about the chickens eating everything before you! It's a given for me! I've been making fermented jalapeno hot sauce for a few years now that is a big hit with anyone who tries it. Similar in simplicity, salt, garlic & water with whole jalapenos, then blend once fermented & put in the fridge. I might try the whey this year. Thank you. I've got just enough peppers hanging in the garden to do a jar! I just made this so I will check back in 7 days to let you know how it came out. 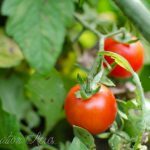 I would love to hear how you ferment your peppers too – my kids eat their weight in hot sauce, I am really wanting to make it myself!! Thanks for this. I have the book and I have the jalepenos. I'm going to try this. Thank you so much for sharing your story! I find that it is really common for people to be afraid of fermenting.. You’ve been taught for so long to wrap up your stuff, cover it up, freeze it, make sure it doesn’t mold! But with fermenting you’re doing the exact opposite and throwing the little buggers to the wolves and hoping they ferment! This looks like a great recipe, I will definitely have to try it myself. Thanks again for sharing!